You are currently browsing the tag archive for the ‘DIY projects’ tag. It’s getting onto lunchtime and my stomach is a’grumble. As I will not be clamouring up the ladder in the rain to check on the roof and eaves troughs today, perhaps I will focus on lunch first. There is always time for DIY projects later, once I have a full belly and can focus better. How about a hot sandwich, for a damp day? Here’s a delicious recipe from Allrecipes.com to add to Crock Pot Corner. Who doesn’t love pulled pork sandwiches! Perfect for the dreary December weather we’ve been having. Pour can of beef broth into slow cooker, and add boneless pork ribs. Cook on High heat for 4 hours, or until meat shreds easily. Remove meat, and shred with two forks. It will seem that it’s not working right away, but it will. With a full belly, how about tackling one of those DIY projects on the list? As Christmas is coming, why not turn an eye to an organizing project or two. 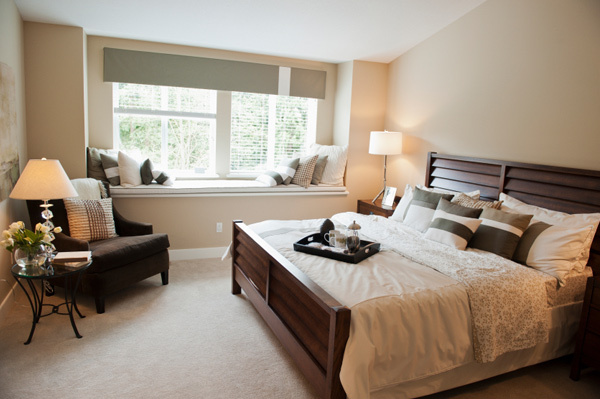 Think spaces that your guests will probably see the inside of; hall closets, spare bedrooms, bathrooms, etc. How can you make these spaces less of an eyesore and more a source of jealousy for your sister-in-law? Let’s take a look. Arrange shoes and boots on appropriate-sized shelves or in storage boxes. There are some great cloth hanging shelving units available nowadays that free up lots of space! Organize scarves and mittens into baskets. Make sure to pair your gloves to make it easier to find them when you need them! Once your guests have arrived, invariably they will make a bee-line for the bathroom, so think about giving a bigger spit-polish to the guest powder room as well. Now, for the overnight guests and a thought to the spare bedroom. Put clean bedding on the bed. Don’t forget to plump the pillows! A mint on the pillow adds a classy touch. Don’t sweat getting it all done today though. There are still three weeks til Christmas. 21 Days and counting! While we don’t all aspire to be the next Holmes on Homes or Bryan Baeumler, most of us want to be able to handle at least a few simple DIY projects by ourselves. That might involve hanging a picture, putting up a shelf or tightening a loose screw or two. Where do you start though? It doesn’t always have to be the Yellow Pages. Don’t let the experts scare you. With the right tools, many DIY projects can be handled by yourself with ease. The trick is to have the right tool for the right job though. And what tools are those? Forget your high heel shoe, the end of the tool box or the heel of your hand. 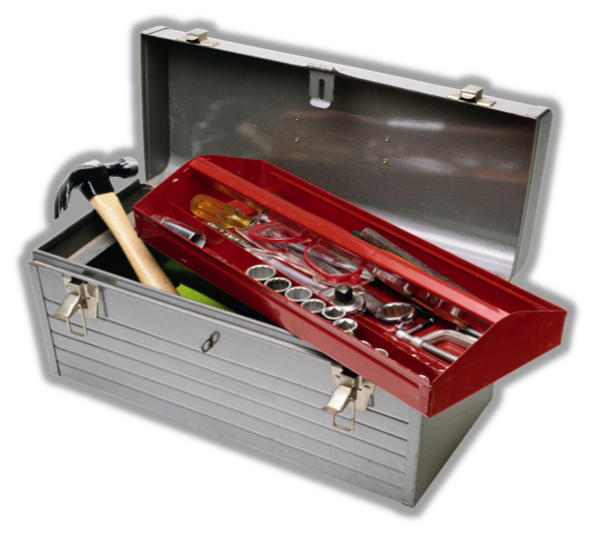 You need a hammer in that tool box for almost every project you can think of. From hammering nails to removing them, a hammer is one of those tools that every good handyman or woman must have. A screwdriver is almost as important as a hammer when it comes to essential tools. The thing with screwdrivers though, is that you must have the right one for the right job. My suggestion to you is to pick up one of every kind; slotted (flat head), Robertson (square head) and Phillips (star head). 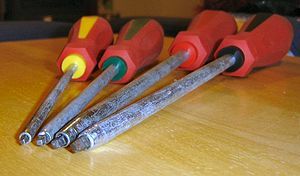 Remember that screws come in different sizes too, so spend a bit more to invest in different sizes of screwdrivers. The wrong size might find you spinning your wheels with nothing to show for it (or stripping the screw and creating a bigger problem to deal with)! If you are hanging a picture or adjusting the height of a table, you will need a level to ensure that you are on an even keel. Eyeballs might seem to do the trick at times, but I wouldn’t be too sure. Just wait until the pencil you place on your “flat” surface refuses to stay put and then tell me how “level” your surface really is. The standard rule of thumb is to always measure twice and cut once. 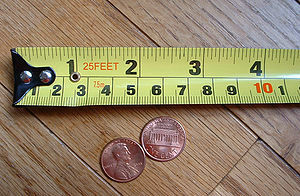 If you need to measure three or four times though, a measuring tape will be your best friend. It ultimately save you time, materials and money, when you don’t have to keep running back to the store to pick up a little more lumber after cutting it too short. Again. I am not talking tweezers here, ladies (kidding!). You should probably invest in needle-nose pliers (for small spaces, wiring and more), as well as vise-grip pliers (to hold something in place or just as easily used as an adjustable wrench, pipe wrench or ratchet) . Pliers are your go-to tool for tightening and/or loosening that which you wish was otherwise. I am including the cordless drill here, as I use it all the time. Don’t just think of it as a souped up screwdriver. You can use it on 2x4s, drywall or to scare away the cat when she is wondering what new fool project you are starting. It can drill in a screw a heck of a lot faster and tighter than with your hand-powered model, thus making it worth its weight in gold. You won’t regret getting one. I promise you. They might not seem like the most glamorous tool to purchase, but the humble utility knife comes in pretty handy when you need to cut up cardboard, open stubborn packaging or scrape some pesky thing. It is a tool that just can’t be replaced when you need it! Paul Bunyan, you may not be, but a hand saw still comes in handy around the house. 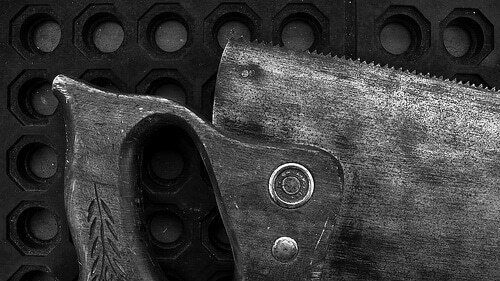 Whether you need to trim down a piece of wood in a small carpentry project, or cut some limbs off the old apple tree, a simple handsaw will come in handy more often than not. Regardless of anything else, safety is the name of the game. With all those tools you have amassed, don’t forget to pick up a set of safety glasses to slide onto your nose. Your eyes will thank you and so will any future DIY projects that you might have in store. Now that you have all those tools, you need somewhere to store them! If you have bothered to spend the money on the tools, don’t throw them in an old shoe box or leave them out on the counter. You will never find the exact tool that you are looking for when you need it most. Plus, that’s a sure-fire way to lose bits, dull edges and damage just about any tool you care to have around. You also might want to invest in work gloves, WD-40, clamps, a wire cutter/stripper, a set of wrenches, a socket set and a Do-It-Yourself Guide to help you through some of the DIY projects that require a little more know-how. Heck, why not throw a plunger in there while you are at it. You never know when you are going to need the right tool for the right job, but these essential tools will be with you every step of the way. We all want to save a few bucks when it comes to home improvements, but when is it time to put down the DIY manuals and pick up the phone to call in the professionals? Well for starters, when you know that you do not have the skills, knowledge, proper tools or general wherewithal to handle a job. It is amazing how that does not deter some people though. I might promote many DIY projects as things that you can potentially handle yourself, but don’t ever forget that your day job is something else entirely and maybe you should just stick with that. In the grand scheme of things, most people are not experts on every DIY project going and you need to remember that. It doesn’t take much to quickly get in way over your head in any project, however seemingly small it is. A dose of smarts just might save you time, money and overall health at the end of the day. Heating: When it comes to the heating system of your home, there is so much to know and so many things that can go wrong. There is gas fitting to take into consideration, the potential for welding of duct work, plumbing to consider, the need of specialized tools, not to mention the fact that you cannot generally walk into a big box store and buy your brand new high-efficiency furnace right off the shelf! Most manufacturers insist on professional installation, so as to ensure the safety and functioning of the equipment (and the people involved!). When it comes to the heating of your home, it is best to leave it to a professional. Electrical: While some electrical projects can be simple enough, like changing a light bulb, other projects can turn into nightmares right before your eyes. For starters, always turn off electric sources before tackling any electrical work. Make sure you have any potential parts, tools and manuals available before you start your project, as a trip to the hardware store in the middle of a project adds valuable time to the job. Always check, double-check and triple check your work before turning the power back on. One wrong connection could see you charred and on your way to the hospital in a hurry. Kitchens: The warm heart of your home is only that if you show it some love. Kitchen projects could potentially include plumbing, electrical, flooring and maybe the hardest project of all, new counters. If you are drooling over granite, you might want to leave that to a professional to size, cut and handle, as you wrong move can leave it chipped, broken or cut in the wrong spot. FYI: you don’t want to glue or duct tape granite back together again after you have cut it in the wrong spot. Roof: You might have an easy two-sided roof that looks like a breeze to re-shingle, but have you really gone up there and eye-balled your roof? 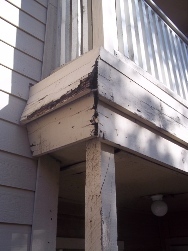 Do you know how to handle peaks, valleys, gutters and flashing? More importantly, have you considered the pitch of your roof and how far you will be off the ground? I bet the lay person would be surprised by how heavy a bundle of shingles really is. Unless you have a crew of seasoned roofers for friends, perhaps you should leave this little project to the professionals as well. Save your ladder climbing for cleaning your gutters of leaves in the fall. Additions: While you might have hung a picture or two, installed a ceiling fan or even built a shelf in your day, that does not mean that just anyone can tackle adding an addition to their home. You need to procure permits, have proper tools, equipment and supplies, as well as the time to tackle this major DIY project. One thing that DIYers often fail to adequately factor in is the time required to do a project. A professional team might be able to build an addition within a set time period, but if you are working on such a major project after your regular work day and on weekends, you just might quickly find yourself living in a construction zone for a LOT longer than you anticipated. Solo Projects: As this recent DIYer discovered, sometimes many hands makes for safer work. A UK man recently slipped and nailed himself to the top step of his home. As he was working alone and could not free himself, he had to wait four hours until his partner came home to call emergency personnel to release him. Surgery was his reward for tackling a project alone. Accidents can happen at any time regardless of skill set. Having another person around can amount to help with the work, another person to draw knowledge from, as well having that extra person around in case of emergencies. If you have the skills, knowledge, tools and time for a job, then doing a project yourself is always a satisfying undertaking, that can often save you some hard-earned cash. If any of those aforementioned items are missing, then a well-meaning project can run off the rails faster than a roll of duct tape can fall off a ladder. Think seriously, plan and think again about tackling any DIY project before you ever pick up a hammer or screwdriver, as even professionals make mistakes. 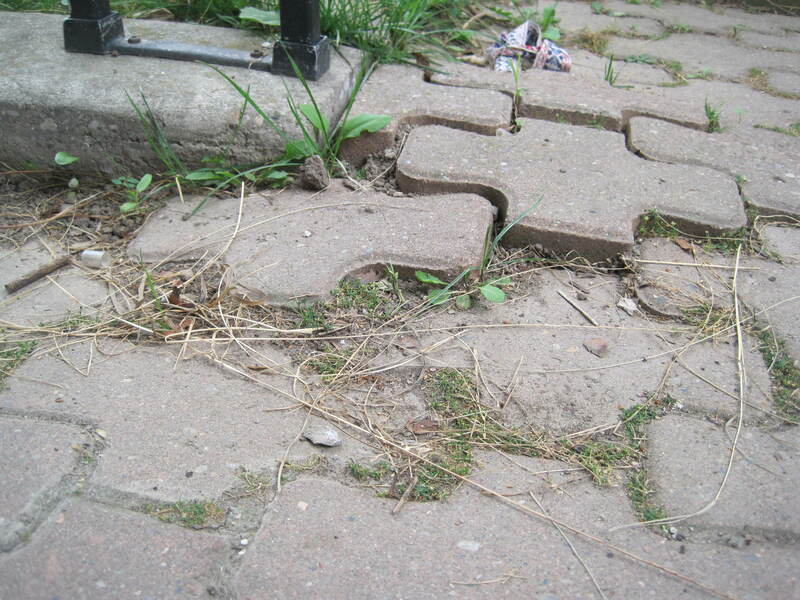 Sometimes, it’s just not worth risking a DIY disaster in your home. Relax, Jim is here with some helpful tips for you today. Would you care for a suggestion for one way to reduce some of those bills? How about repairing that leaky faucet that you keep doing your best to ignore. While you might just have a drip or two a minute, a leaky faucet can waste up to 10,000 gallons or 38,000 litres of water per year. When water restrictions loom in hotter months, you might notice more, but why not attack the problem now, before all that money just slides right down the drain. Today, I am going to share a few tips on how to repair that leaky faucet and save some money in the process. While the easiest solution to fix a leaky tap may be to call in a local plumber, I know there are more than a few handy folks out there that refuse to turn down an opportunity to tackle a DIY project. If you fall into that category, this is a relatively easy project that can potentially save a significant amount of money on your water bill. 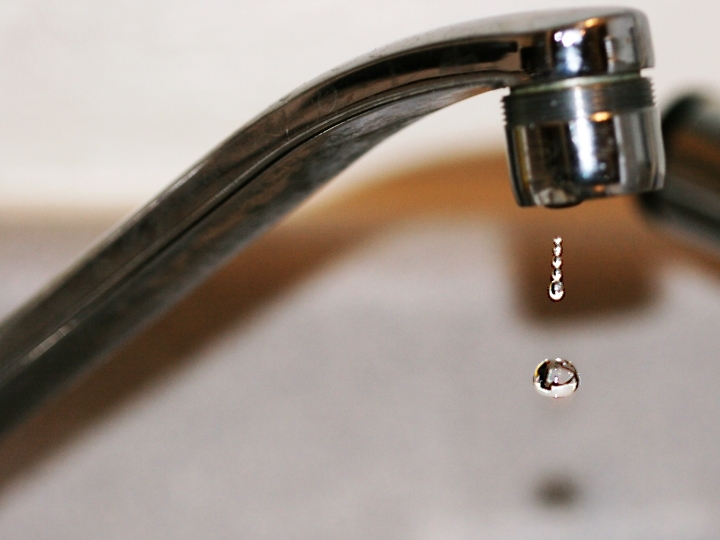 Before you start the project, make sure to turn off the water to the faucet. For most taps, there is water shut-off valve located under the sink. If that is not the case in your home, you may have to turn off the water to the entire house. Next step is to assess where the leak is coming from. If the leak is in the handle, then carefully pry off any decorative covers to give you access to the screws that hold the handle in place. Grab your screwdriver and loosen the screw, then gently slide the handle off. Inspect the washer and replace if it is worn or broken. Then simply reassemble the handle and tighten the screw holding it in place. Turn the water back on and check to see if the leak is gone. Easy! If the leak is in the actual faucet, you follow very similar steps. Again, make sure that the water has been turned off before starting. There will still be a minimal amount of water when you take the taps off, but nothing like the geyser you will get if you forget this critical step! FYI: Taping the ends of your wrench is also an easy way to ensure that you do not mar the finish of your faucet while you are working on it. So, with your adjustable wrench, gently loosen the nut at the base of the faucet and slip it off. Carefully pull the faucet off and inspect the washer on the base of it. Again, if it is worn or broken, go ahead and pry it off, then replace it with a new one. Just a note, make sure that you replace any washers with identical sized ones or else that leak that you are working so hard to eradicate will still more than likely be there. Last steps are to replace the faucet, tighten the nut at the base of the faucet, then turn the water back on and check for leaks. Hopefully any leaks that you had before are now gone! If not, grab the Yellow Pages and start dialing. For further tips and a brief walk-through of the process, check out this helpful video from eHow. And happy plumbing!